Although classified as a plucked string instrument, the Chinese yangqin is in fact a hammered dulcimer, played with rubber-tipped sticks. In the shape of a trapezium, the yangqin is stringed in groups; each group consists of four to five individual strings that are tuned to the single same pitch. Long bridges with plastic, ivory or metallic tips are used to support the strings. The yangqin is believed to have originated in Central Asia, but was in fact first brought to China by sea-faring European traders at the end of the Ming Dynasty (around AD 1600) - this is evident from how popular the yangqin is in the coastal trading regions around Guangdong. It was consequently popularized throughout the whole of China, even through areas as far as Tibet and Xinjiang. 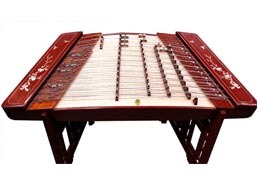 Back in the past, this Chinese dulcimer merely had two bridge sets and three rows of strings; this severely limited the range of the instrument. However, following China’s liberation, the yangqin was reformed - the revolutionized yangqin that we know today has since become a staple of the Chinese orchestra. Currently, the yangqin possesses four bridge sets. Each are typically of wood, and possess peaks and cavities to fit the strings resting on it. A single bridge may contain from seven to ten peaks. The Chinese yangqin is sounded by using bamboo sticks with hammer tips to strike its strings. The bridge peak that supports each group of strings help create tension, so that striking the strings produce a note. This sounding methodology is what gives the yangqin its characteristic reverberating quality. Want quality Yangqins from a trusted source?